TO KEEP THE MEMORIES ALIVE. There will be disagreements on some of my selections and nods of agreement from others on some of the selections. One thing is for certain, there have been some outstanding high school football players to come out of Jefferson High School. Perhaps you wonder why I feel I could put together a list of the most outstanding Jefferson High School football players. I prefer to ask, who else is better qualified for the task than me? I attended my first Jefferson football game in 1953 as an 8-year old. I didn't see any of that game as I played football with other kids behind the press box. That game was Commerce-Jefferson. It was two years later that I finally persuaded my cousin Tom Williamson, who had played on that 1953 team, to take me to another game. It was Commerce-Jefferson in 1955. I watched every play in that game. I became a football fan and have remained a fan to this very day. How many Jefferson fans can say they have seen every Jefferson-Commerce game since 1955? I can! For 26 years I carried the down marker at Jefferson home football games at Memorial Stadium. I missed only two home games due to illness during that period, and I also attended probably 95 per cent of the Dragons away games during those 26 years. Even when I was living away from Jefferson, I always came back to town for that spectacular Commerce/Jefferson rivalry game, and several more games during the football season. I don't know how many Jefferson games I have seen, but I can say that I have probably seen every Dragon team play three or four games every season since 1955. I have seen every player that has played for Jefferson over the last 60 years. Many of them from up close on the side-line. I authored a book, "The Golden Age Of Jefferson Dragons Football" that covered the Jefferson football program from 1947 through the 1964 season. This required extensive research that brought me extraordinary insight for the years that I was "too young" to attend Jefferson Dragons football games. I later collaborated on a book ~ "We Believe" ~ that featured the 2012 Jefferson Dragons State Championship season and provided a complete history of Jefferson Dragons football. Does that make me qualified to select the TOP 160 players in Dragon history? I don't know the answer to that question, but I do know I have a strong opinion as to who I feel are the best players to ever wear the red and blue. I am now publishing that opinion. Every Jefferson player that ever made all-state or all-state honorable mention by the Associated Press ( AP ) or the Atlanta Journal/Constitution are named on this 160 player list. The rankings are based on high school performance and skill level only, ( not later college or professional success ) contribution of the player to team success, and in many cases, simply my opinion, since I did see all the Jefferson players since 1955. To see the rankings of Jefferson players that went on to Division-1A football, go to JEFFERSON DRAGONS LEGENDS and scroll down to "Football Superlatives." As for the former players that failed to make the list, I know how you feel. If someone else were to make a listing, it would probably be very different. Everyone has their own opinions just as I have mine. I would have been thrilled to see my name on the list, but I can realistically say I was not in the league as a player with the guys named on the top 160 player list. I realize everyone will not look at this in the same light as I do. Of course there are players that are not on the list that were as good as some players who are on the list, but I do think I managed to pull out the cream of the crop. The very best of the best! Keeping the memories alive ~ That's what it's all about . . . Here's hoping these Jefferson High School football players will always be remembered for carrying the Dragon banner with pride on the football field. I have said it before and I'll say it again . . . Once you put on that red and blue and become a Jefferson Dragon, you are always a Jefferson Dragon. Who Is The Best Football Player That Ever Played For The Jefferson Dragons? Usually it would be quite a difficult task to pick a "best" out of an estimated 3,000 former Jefferson High School football players. The selectee after the 2017 football season made it a no-brainer as to his selection as "The best football player ever to play for Jefferson High School." During his four year career as a Dragon he rushed for 5,786 yards on 874 carries for an 6.62 yards per carry average. As a freshman in 2014 he gave a preview of what could be expected later with a 92-yard touchdown run against Winder. He carried the ball 70 times over the course of the season for 486 yards or 6.94 yards per carry. He ran for 8 touchdowns. The Dragons finished with a 12 - 1 record and made the state elite 8. As a sophomore in 2015 he had one of the best seasons in Georgia football history with 2,119 yards gained on 321 carries. His per carry average gain was 6.60. He scored 32 touchdowns rushing and 1 on a pass reception. He caught 17 passes for 203 yards. He became the first player in Jefferson history to score 5 touchdowns in a game twice. He reached this milestone against Oconee County and Winder-Barrow. He also became a standout on defense with 29 tackles. He had 4 interceptions on defense. He was named the Banner Herald Northeast Georgia Player of the Year, the all-region player of the year and all-state Class 3-AAA player of the year. The Dragons reached the state playoff sweet 16. His junior year saw him rush for 1,642 yards on 238 carries for a 6.90 yards per carry. He ran for 20 touchdowns and caught 18 passes for 355 yards and 4 more scores. He had 30 tackles on defense. He was the region 8-AAAA player of the year, Athens Daily News Player of the Year, All-state and the Class AAAA Offensive Player of the Year. The Dragons reached the State Final Four with a 12 - 2 record. As a 5'10", 180 pound senior he was again the sparkplug behind the Dragons drive to the state elite 8. He rushed for 1539 yards and 19 touchdowns and caught 24 passes for 270 yards and 5 touchdowns. 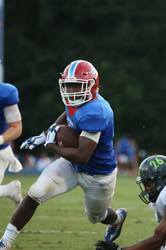 He concluded his Jefferson career with 5,786 yards rushing and 79 touchdowns. The 79 TDs rank him 15th in the state history of Georgia high school football. In his four years at Jefferson, the team won 44 games and lost only 8 games. He is the only 3-time all-state player from Jefferson, the only 3-time All-Northeast Georgia player of the year, the only 3-time region player of the year, and the only 2-time statewide classification player of the year. He has received a scholarship to play football at Wofford. There is no reason to not expect him to excell at this next level of his life in football participation. The 2018 cecilbuffington.com top 160 football players in Jefferson Dragons History is proud to name Colby Wood as our best of the best. While there might be some discussion on numbers 2 - 160, I think most will agree, there is not much doubt that Colby Wood's stats and outstanding performance over four years merits the number 1 ranking. THE TOP 160 JEFFERSON HIGH SCHOOL FOOTBALL PLAYERS OF ALL TIME BY CECIL BUFFINGTON THROUGH THE 2017 SEASON. Bryant Shirreffs Led the 2012 Jefferson Dragons to the Class AA State championship. Shirreffs was the Class AA Offensive Player Of The Year in Georgia Class AA football. His selection is easy to understand when you look at his amazing stats for the season. Shirreffs completed 174 of 267 ( 65.17% ) passes for 2.369 yards and 18 touchdowns. He had 177 caries for 1,372 yards with 20 rushing touchdowns. He was responsible for 38 touchdowns by run or pass. He average 7.8 yards per rush. Shirreffs is currently playing Division 1 football at Connecticut. End Burton Riddle ( 33 ) and twice All-State halfback Jeff Davis ( 27 ) co-captained the 1960 Dragons. Jeff Davis scored 23 touchdowns during the season and rushed for 1,790 yards. During his Jefferson career he scored by rushing, pass-receptions, kick-off, punt and interception returns. He scored 5 touchdowns in a game on 2 occasions. He is considered the best all-around football player in Jefferson Dragon history. 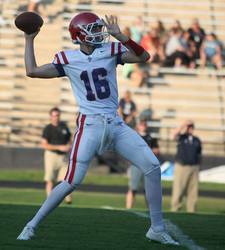 Evan Shirreffs was 164 - for - 236 ( 69.49% ) passing for 2,693 yards and 23 touchdowns during the Dragons 12 - 1 season in their first year in class AAA. 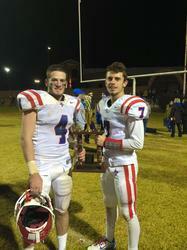 The Two Jefferson Dragon first team all-state players from 2014. Tradd Porter - ( # 4 ) Free Safety - 89 tackles, 2 forced fumbles, 4 interceptions and 11 pass breakups. Dalton Hill - ( # 7 ) Wide receiver - had 47 receptions for 1,069 yards and 9 touchdowns. He also had a punting average of 42.0 yards per punt. 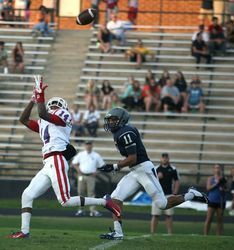 T. J. Skelton ( # 14 ) led the 2014 Dragons in pass receptions with 48 caught for 928 yards and 8 touchdowns. He stepped in at quarterback in 2013 when Evan Shirreffs went down with an injury and was outstanding as a signal caller. One of the best all-around players in Jefferson history. Benny Tompkins ( # 30 ) was a four-year starter at fullback and line-backer for Coach John Davis in 1956. He had 856 yards rushing for the season. He had 116 unassisted tackles in the 1956 season in 10 games. He was also the teams punter and place-kicker. Billy Ricks ( # 27 ) scored 19 touchdowns for the Dragons in 1956, scored 114 of the team's 182 points, rushed for 1,523 yards for one of the best Dragon teams of the 50's. He was also an exceptional defensive cornerback with 73 tackles for the 10 game season. Curtis Segars scored 185 points to finish second in the state behind Commerce running back Gene Baird. Baird had 188 points. Segars averaged 217 yards per game rushing and pass receiving. He rushed for 1,881 yards on 198 carries. This was 9.50 yards per carry. He had 23 rushing touchdowns, a 92 yard fumble return for a touchdown and a 68 yard punt return for a touchdown. Segars received a grant-in-aid scholarship to Georgia Tech after the 1950 football season. Colby Wood, the number one rated football player in Jefferson history rushed for 5,786 in his career on 874 carries. He scored 79 touchdowns. These are all Jefferson records. He twice scored 5 touchdowns in a game and four times scored four touchdowns in a game. Also Jefferson records. His Jefferson teams won 44 games with only 8 losses during his four year varsity career. He was a three time all-state player and twice the offensive player of the year in Class 3-AAA and Class 4-AAAA.